The handles are a dead giveaway as to what this cyclone dust separator is made from. Dust, like dog fur tends to accumulate everywhere and on everything. It seems no matter how much you dust, it returns only a few short days or even hours later. Working in a shop (wood, metal, etc.) only tends to increase the amount of dust accumulation to that of biblical proportions. Combating that dust can be costly, especially using industrial-sized air filters, however with a few odds and ends it can be done rather cheaply and effectively thanks to instructables user TabLeft. 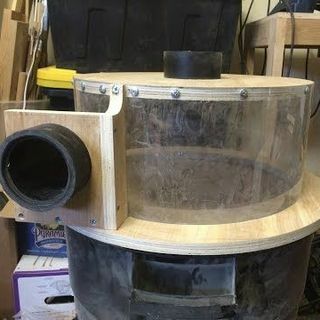 Using an ordinary polymer trashcan, TabLeft constructed his own Cyclone Dust Separator with items found in most workshops, including a shop vac. The top hat-style separator features a base and top made of plywood with a clear polycarbonate panel to see the cyclone work its action. A Thien baffle allows for the separation of dust and particles in the trashcan container using a shop vac for suction (little dust is accumulated into the vacuum itself). Another port allows for tool exhaust to be channeled directly into the separator, which is done by simply switching hoses. While the separator is very loud, it’s also very efficient and won’t break the bank.